Any time soccer lands a featured role on the American mainstream media schedule, it’s a good thing for Major League Soccer. So while the U.S. women’s national team makes its run for the 2015 FIFA Women’s World Cup, the men of the MLS — the top professional soccer league in the U.S., but widely considered minor-league level compared to the elite leagues in Europe — are benefiting from the increased interest in the sport. Approaching the midpoint of MLS’ 20th season, Kei Kamara has taken his place in that spotlight as one of the league’s top stars. 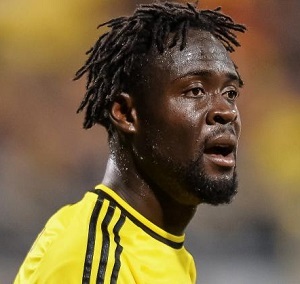 Kamara, a 30-year-old Muslim from Sierra Leone, plays forward for the Columbus Crew. Through his team’s first 15 matches Kamara leads MLS with 10 goals while keeping the Crew in the playoff picture, two points ahead of the Philadelphia Union for the sixth and final Eastern Conference postseason berth. The going is potentially about to get rougher for Kamara, however, because by the time Columbus takes the pitch for its next match, the Muslim holy month of Ramadan will be underway. To fast or not to fast: That is the question every Muslim athlete faces when their sport presents a schedule — whether it’s practice, competition or offseason training — that is not exactly conducive to abstaining from a morsel of food or a drop of water during daylight hours. There have been plenty stories over the years of Muslim athletes suffering due to fasting during a time when they’re also trying to keep up with the physical demands of their sport. Former NBA player Zaid Abdul-Aziz once fell so ill while trying to fast during two-a-day practices for the Houston Rockets that he briefly decided to retire from basketball. Pro boxer Amir Khan missed out on a possibly career-defining lucrative bout against Floyd Mayweather Jr. because he didn’t believe he could get his body back in fighting shape post-Ramadan in time to meet the date Mayweather insisted upon. Some Muslim athletes choose to strictly adhere to the fast no matter what, such as NFL defensive back Husain Abdullah and retired basketball Hall of Famer Hakeem Olajuwon. Some will fast only on days when they don’t have a game or a practice, with plans to make up the days they missed in Ramadan later in the year by fasting or giving to charity. Others will not fast at all during Ramadan, with plans to make up the entire month at a later time. “When I was in Houston, when I had days off or very light days, I’d do it,” the Sporting Kansas City forward, a Muslim, says of Ramadan, the holy month that requires fasting from sunup to sundown. “And when I first got here, I wanted to try it. With that, Kamara shakes his head. Ramadan is about self-discipline, about giving, about perspective for those less fortunate, about cleansing the soul. But it also provides a conundrum for Muslim athletes, both at the Olympics and back home: Should you emaciate your body? Or your faith? This year presents an especially interesting dilemma for Kamara. He is a serious contender to win MLS’ Most Valuable Player award, and his team is fighting for a postseason berth. If he fasts, be it for the entire 30 days of Ramadan or just on his off days, it’s conceivable that he could become physically weaker during an important stretch of the season. Olajuwon, however, is one Muslim athlete who proved there are exceptions to what many believe is a rule. The two-time NBA champion and former MVP was typically better statistically during Ramadan throughout his career. Olajuwon thrived during that time by sharpening his focus and mental strength. In 2014, Ramadan began during the FIFA World Cup in Brazil (the men’s version). At the time, Algeria was the lone Muslim-majority country still standing in the field in the round-of-16 knockout stage, although there were other Muslim players scattered among the remaining teams — such as Mesut Ozil of Germany, the team that would eventually win the World Cup. While it was not publicized what the entire Algerian team decided to do, captain Madjid Bougherra had said going into the tournament that he planned to fast for Ramadan no matter what. Algeria lost to Germany, 2-1, in that knockout-round match. In previous years when he chose not to fast for all of Ramadan’s 30 days, Kamara made up for it by giving to people in his home country.